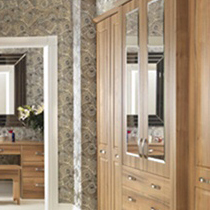 Features such as fretted window panes, bevelled edged mirror doors and thick pillasters combined with the opulent woodgrain of Lyon gives the essence of grandeur in this setting for your fitted bedroom furniture. 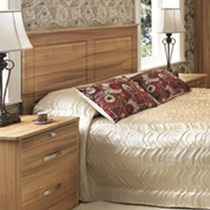 This is an example of one of our made to measure bedrooms. Lyon walnut is available in any of the 50 styles on show. 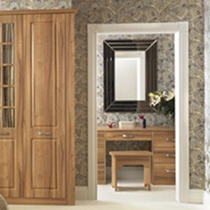 Made to measure means you can be sure to fill every usable space even in the smallest of bedrooms.